When the weather is dreary and cold like it is now, I love to turn that oven on and bake away. Yesterday was one of those days when I knew a decadent dessert was in order. The kids are on Christmas break so I let them choose the dessert de jour. Two of them asked for brownies while the other two agreed on cheesecake. I knew that Brownie Swirl Cheesecake was the answer to this dilemma. If you have never made this, I highly recommend trying it, it is very easy and super delicious! Preheat oven to 350 deg. Prepare brownies as directed and pour into springform pan. Bake 10-15 minutes, depending on the size of your pan and brownie mix amount. I used about only 3/4 of the brownie batter simply because I didn’t want the brownie portion of the dessert to overpower the cheesecake. Next, mix the cream cheese, sugar and vanilla on medium speed until smooth. Add one egg at a time, mixing after each until completely incorporated. Add cream cheese mixture to springform pan. Melt chocolate chips in microwave and spoon onto cheesecake mixture. 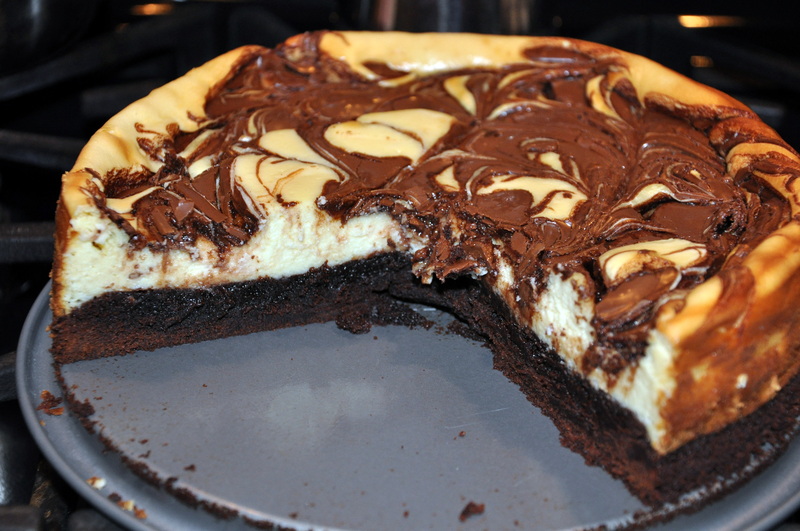 take a knife and cut through the chocolate/cheesecake several times to create swirl effect. Bake another 30-35 minutes. Allow to cool completely then run your knife around the edge of the cake to separate it from the pan. Chill for an hour or so and enjoy! Mom, writer, domestic goddess, superhero extraordinaire. Yeah, that's me. This entry was posted in Food, Parenting, Recipes, Uncategorized and tagged Brownie Swirl Cheesecake, brownies, chocolate chips, cream cheeese, cream cheese mixture, decadent dessert, easy dessert, family, kids, winter. Bookmark the permalink. The kids just about finished it off this afternoon, I will try to save another piece for you! Free Sandwich for High School Students! © Orland Park Mom & OrlandParkMom.com, 2011. Unauthorized use and/or duplication of this material without express and written permission from this blog’s author and/or owner is strictly prohibited. Excerpts and links may be used, provided that full and clear credit is given to OrlandParkMom with appropriate and specific direction to the original content.